Inside the hoophouse and under a floating rowcover we have a number of vegetables growing. This is a buttercrunch lettuce that loves the cold..not enough that we can grow it outside, but inside it is growing beautifully. In the summertime we fight bugs. We check the vegetables daily and pick things off. Sometimes slugs find their way into lettuce. The heat causes lettuce to bolt..one day all is well, the next day seed stems are sprouting from every head of lettuce, which usually turns the lettuce bitter. 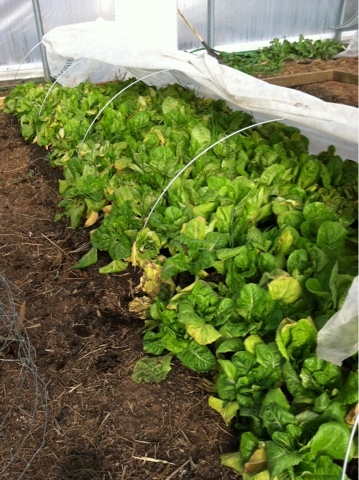 In the wintertime, even when the temperature is in the single digits at night, we can grow lots of greens. The seeds are planted in August/September/October, they sprout quickly, and then grow slowly. Under 2 layers of covers it is like growing almost 2 USDA zones south of here..not quite tropical but enough that we can eat this all winter. This week we have had a couple of green salads with this as the base. Homer also made a chicken sandwich with lots of lettuce on it, yum. And for garden club on Monday I'll take a big salad from here and a pot of chicken soup. The president of Landreth Seeds is speaking, and I might just show her this photo.